AVIATION, TOURISM AND CONSERVATION NEWS from Eastern Africa and the Indian Ocean islands. You can get your daily breaking news updates instantly via Twitter by following @whthome, join me on www.facebook.com/WolfgangHThome where the articles also cross load or read the daily postings on my blog via www.wolfganghthome.wordpress.com which you can also follow to get immediate notification when a new article is posted. With over 75.000 South Africans travelling to East Africa every year on business and on holiday South Africa has become one of the most potent African market places for inbound operators in Kenya, Uganda, Tanzania and Rwanda. As a result of personal experiences of visiting Eastern Africa, there is now a growing demand for corporate MICE events to be held in these places, often only 4 hours flight away from Johannesburg and as such within easy reach, considering the multiple daily frequencies of airlines like Kenya Airways, South African Airways and RwandAir between the respective countries. East African tourism companies can target this lucrative market by participating in Derek Houstons Spotlight on Africa workshops in Cape Town and Sandton from October 02-04 where this crucial market segment can be met in direct B2B contacts or on a broader basis. 180 South African travel agents, tour operators, conference organisers and incentive travel companies are expected to attend the three workshop sessions. A feature of the Spotlight Workshops is the attendance by many inbound operators who organise Pan African itineraries on behalf of their foreign, often Asian or Eastern European based wholesalers. The planned programme for this series of meetings in Cape Town and Gauteng has been given as: Tuesday October 02 Cape Town morning workshop. Wednesday 03 October Johannesburg morning workshop. Thursday 04 October Sandton morning workshop. Potential exhibitors can choose to do all three sessions or just the two sessions in Johannesburg / Sandton which might in particular suit Kenyan exhibitors who are attending the Magical Kenya Expo the weekend before. 18 companies representing ten African countries have already booked tables and there are still a few tables available. 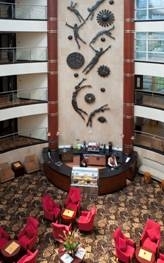 East African companies who have booked tables include Destination Connect Kenya, HTT Holidays & Incentives,, Paradise Beach Hotel Zanzibar, Kaskazi Beach Hotel Kenya, Doubletree by Hilton Zanzibar & Tanzania, Nairobi Upper Hill Hotel and City Lodge Hotel Group will be showcasing there recent addition to their portfolio of The Fairview Hotel Nairobi. Given the large numbers of South Africans visiting Rwanda and Uganda and the increase in the number of flights, Derek is keen to encourage Ugandan and Rwandan operators/hotels to participate in the event. Today the 11th anniversary of the most heinous terror strike ever will be remembered by the families and friends of the thousands of victims who lost their lives when two hijacked aircraft struck New Yorks Twin Towers, another struck the Pentagon and one was brought down in Pennsylvania after passengers overpowered the highjackers on board and prevented another similar scenario, sacrificing their own lives in the process. Also remembered today will be the rescue workers who have since their heroic efforts died themselves, after ingesting toxic substances and succumbed to a number of ailments identified as being directly linked to the event. Ten times remembrance services were held since then with the main culprit still on the loose after the Bush administration took their eyes off the main target and instead led, if not outright misled America and many of her allies into a war in Iraq, rather than hunting down Bin Laden and his bunch of terrorists and bringing them to justice. This year though is different as terror mastermind Osama Bin Laden has finally met his own fate at the hand of American special forces after having lived in Pakistan for years, where officials predictably denied any knowledge of his presence as well as any complicity but in turn were swift in accusing America of violating their sovereignty. Bush wanted Bin Laden dead or alive, and it was finally the Obama administration which delivered a promise made back then but not kept at the time. Many of Al Qaidas key figures involved in the 9 / 11 events are now dead or in custody but the threat remains potent as a new generation of terrorists has since emerged, constantly probing and exploring new ways to wreak havoc on air transport, public infrastructure installations and of course not sparing the innocent in their pursuit of evil. The events of that fateful day radically altered air transportation security, continue to impact on everyone wanting to fly until today and have led to a series of additional measures put in place by airlines and governments to prevent a repeat. After 9 / 11 nothing to do with air travel was ever to be the same again as airlines and security agencies are now working hand in hand to anticipate new threats and new terrorist methods like using explosive underwear and devise defensive anti measures to keep us passengers safe. Inspite of glaring inconsistencies, and failures, so far it has worked, with a bit of luck at times surely and with a good dose of annoyance when little village chiefs in TSA or other uniforms take out their own agenda on travelers. But this is not the place or time for such reflections. Today is all about those who perished, the firefighters of New Yorks FDNY, the innocent on the four aircraft, the innocent on the ground in New York and Washington, and last, and well deserved for them, the cowardly perpetrators of these unspeakable crimes. There was no warm welcome in an imagined heaven for them but the hottest fires of hell surely are their eternal reward now. And as the clock moves towards the moment when the first plane struck, it is time to stand in silence for a while and remember how the world changed in that instant, to remember the souls lost and to think of those who were left behind without fathers, mothers, brothers and sisters and have to remember year after year what tragedy befell them on the most personal level. And so, as we enter another year at the end of which it will be a dozen commemorations, let us stand firm in opposing that evil terrorists have brought upon the world and not let it change who we are and how we live our lives. Egypt Air has for now resumed flight operations from Cairo, including flights to the Eastern African destinations like Nairobi and Entebbe, after representatives of striking cabin crew and government reached a temporary understanding, however according to information received only holding until the weekend. If at that time the airline has not made an acceptable offer to the unions, strikes may well resume, once again halting operations, a scenario which could seriously affect the ongoing recovery of in particular the tourism industry in Egypt. While the airline had tried to operate some flights with subcontracted crews most of the departures last Friday were affected before government stepped in to prevent a longer dispute could deal a crippling blow to domestic travel and to international arrivals of tourists and business visitors. Watch this space and if booked with Egypt Air, stay in close contact with their local airline or airport offices. Brussels Airlines, the airline with the longest uninterupted service record to Uganda, the Pearl of Africa, has announced that for those wishing to join Independence Day on the 09th of October this year, their flight on the 06th of October from Brussels to Entebbe, and from other SN destinations going there via Brussels, for instance from New York, will be getting a 50 percent rebate for tickets when using this special Golden Jubilee celebration flight. This special promotion was launched yesterday by Ugandas Brussels Airlines Country Manager Benjamin Puissant and his sales team, led by Belinda Sebunya was quick to spread the news overnight, allowing for a timely reproduction of this extraordinary offer here. – 50% discount on the air fare (not the taxes) for guests from any Brussels Airlines destination in Europe or coming from New York. Flight to Uganda on the 6th of October, return flight between 10th and 20th of October. +256 41 42 34 201 with the mention of Brussels Airlines Golden Jubilee Offer. As Uganda is now in the final countdown towards our 50th Golden Jubilee of Independence for which a host of African heads of state are expected to gather in Kampala to witness the occasion, those friends of the Pearl of Africa living in the United States or in Europe will be able to plan for their presence at a hugely reduced cost, so a big thank you is in order to Brussels Airlines for making this possible. Savoir Vivre in the air come visit us. The Uganda National Roads Authority has now published the approved guidelines for compensation procedures, as the new highway project from the city to Entebbe gathers momentum. Approved by the last parliament in its final session, the new highway will link Kampala by dual carriage from the Northern bypass to the Entebbe municipality, while a branch road from Lweza / Kajjansi will connect the lake side resort of Munyonyo to the new highway, opening up a direct link for visitors coming to Uganda for conferences, large meetings and conventions, many of which are regularly taking place at the Speke and Commonwealth Resorts. The new highway, over 50 kilometres long, is expected to significantly cut travel time from and to the Entebbe International Airport and decongest the present Entebbe road, which as a result of new housing estates coming up along the route finds ever more commuters using it on a daily basis, often causing those rushing to the airport for their flights arrive late. The upcoming compensation exercise, which will pay fair valueto those subjected to compulsory acquisition of their land to build the highway, will then pave the way for the Chinese contractor to come on site and commence construction, though landowners are already complaining to be offered far too little for their properties. This latest development is following the agreements of late 2010 and early 2011, when the Chinese and Ugandan governments agreed to have this proposed new toll highway built and signed their MoUs. The project is part of a greater infrastructure development programme by government to bring the Kampala Metropolitan Area into the 21st century with new roads, highways and bridges to make access to the capital easier and reduce the eternal traffic jams at the presently very limited entry points into the city and the Central Business District. Watch this space, though it may yet take a while, should court cases be brought over compensation disputes, before ground is eventually broken. Embattled Amos Kimunya, for now still Minister of Transport while his fate hangs in the balance over investigations by parliamentary committees and after locking horns with cabinet colleagues, will have swallowed hard when the last cabinet session on Thursday this week, chaired by President Kibaki, tossed his feeble objections out of the windows and directed that Project Greenfield be advanced with all due haste and with the inclusion of all relevant stakeholders. Kimunya had made a mockery of his sworn allegiance to the President when he declared he could not care less who was going to break ground for the project, after it became known that President Kibaki was keen on doing that while still in office, and sooner rather than later this attitude will result in the inevitable political consequences. Going like that against a president was in the past enough reason to be sacked, or worse, but Kibaki, a political rock in his own right, will probably rather have parliament do the dirty work and censure Kimunya than having to sack another minister, less than 7 months prior to elections. The minister had also casually dismissed the legal opinion of his cabinet colleague the Attorney General and in an almost trademark move attempted to direct KAA to overturn the tender award made in December last year, without however having the stick at his disposal to enforce such a directive. Efforts later on to have his loyalists on the KAA board suspend if not sack Gichuki also failed, resulting in more egg on faces. The cabinet directive, given according to a regular very senior government source as in your face Kimunya, now clears the way for the Kenya Airports Authority to move ahead with the project, resolve remaining financing issues with the main contractors Anhui Construction from China and then commence the works, presently several months behind the initial schedule. 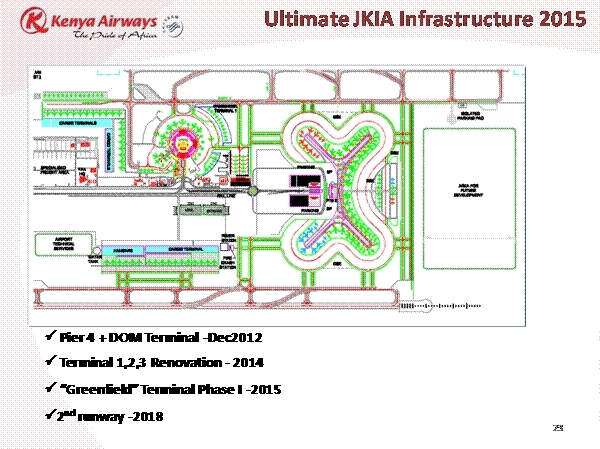 The workscope includes the much overdue second runway for JKIA, a connecting taxiway as well as another mega terminal, due to be used almost exclusively by Kenya Airways and their partners in SkyTeam like KLM, Air France and others, as well as other code share partners, allowing the national airline to continue their relentless rollout of Project Mawingo. In this plan is outlined their 10 year strategic plan which will see the overall fleet, including 12 cargo aircraft, grow from presently 37 one aircraft is enroute from Embraer to Nairobi as this report is uploaded to 119 and destinations to grow to 115 destinations on all continents. While Kenya Airways strategic plan is aimed to keep them in contention for the top slot in African aviation, the Project Greenfield is a crucial component of Kenyas Vision 2030 which is aimed to ensure the regional and continental competitiveness is retained and enhanced and Nairobi remains the wide regions preferred aviation hub. Time to get on with it then it seems and get the project financing resolved and ground broken to catapult Kenyas aviation sector truly in to the 21st century and beyond. Watch this space. Filling the shoes of an acclaimed predecessor like Hubert de Marais is never going to be easy but Fairmont Kenya went out of their way to secure the services of Karan Suri, who going by the feedback received while in Kenya over the past 10 days, could just be the man for that job, turning those shoes into a jet bigger size. Last Friday, while already on other assignments, Fairmont held a tasting session at the Norfolk Hotel, and a real miss it was going by the feedback from my Kenya grapevine it seems. A group of journalists was invited to the Norfolk last Friday to sample some of Karans creations and give a glimpse into the culinary direction he will take the Norfolk, the Mount Kenya Safari Club and the Mara Safari Club to as he establishes his own footprints on the menus. From information received Karan served previously in similar positions at Oberoi Hotels, at the Raffles Fire and Ice in Dubai and the Leela Palace in Dehli, before being recruited by Fairmont to become their main food man in Kenya. It left Karan apparently self confident enough, displaying brass when amongst the selection of starters, main courses and desserts on offer he laid down his personal challenge when including one of his predecessors signature dishes, the Morendat Striploin. Daring perhaps but I can only go by the feedback from a fellow scribe who shared his culinary impression by saying he could never have imagined that beef could taste so spectacularly good. Well, there you have it the first test was passed and the lesson for this correspondent was not to make appointments and other arrangements when food tasting at Fairmont The Norfolk is in progress, as that is and has always been a highlight for the palate. Next time when in Nairobi a personal visit to the Chefs Table is perhaps in order, to give my readers a more adequate description of Karans abilities, than having to relay on hearsay and PR releases inspite of their glowing descriptions. Watch this space. This weekend will see the arrival of fleet aircraft number 37 at the Kenya Airways base in Embakasi / Nairobi, another Brazilian built Embraer E190, with the difference that the livery will reflect the airlines membership in Sky Team, one of the worlds leading airline alliances. Already is a B737-700 in service with the same livery, incidentally flown on just a short while ago enroute from Nairobi to Mahe, and both will be advertising Kenya Airways strong partnership with leading world airlines, like KLM and Air France. Wary of the aggressive rollout by leading continental competitors, one of which beat The Pride of Africa by a year and a half with the first African delivery of a B787 Dreamliner, Kenya Airways appears set to respond in kind by adding more domestic and continental destinations in the race for superiority in the African skies. In October at least two launches are due to take place, Eldoret, a large town in Western Kenya with 10 flights a week, two on most days but none on Monday from information presently available, and tickets for the launch period are sold for 59 US Dollars, all taxes included, signaling Kenya Airways mood to fight for market share on that route, previously owned by Jetlink and another airline. Also due appears to be Abuja for launch next month, which would connect another African capital city KQ intends to fly to all political and commercial capitals by the end of 2013 besides multiple flights already to Lagos, Nigerias commercial capital. When the new bird arrives to a champagne welcome on Saturday, it will be happy landings to crews and passengers from then onwards, as the Pride of Africa continues to stay the course mapped out under Project Mawingo, the airlines 10 year strategic plan. Watch this space. Time has finally ran out for the trio of accused, Ms. Rebecca Nabutola, a former Ministry of Tourism Permanent Secretary, Dr. Achieng Ongonga and one Duncan Muriuki over a case which emerged against them in 2008, when they found themselves in the dock over allegations of unauthorized use of funds and conspiracy to defraud. Dr. Achieng, erstwhile CEO of the Kenya Tourist Board, was sentenced to three years in jail with an added fine of 1.5 million Kenya Shillings, and failure to pay would add a further 3 years to his sentence. Ms. Nabutola, then Achiengs superior as PS in the line ministry, got four years in jail for her part in the scheme and was given a 2 million Kenya Shillings fine. Duncan Muriuki, the apparent beneficiary of the conspiracy and himself a former KTB member of the board of directors, was in turn given a whopping 7 years in jail and has to repay some 18.3 million Kenya Shillings, the sum in question which was paid out by KTB, when Achieng and Nabutola connived in clear violation of laid down procurement and payment rules and caused the transaction to go ahead. At the time, the board of directors had not been re-appointed as yet, leaving a gap in supervision which very likely prompted the three convicted individuals to hatch the scheme and exploit the vacuum on the top. Achieng and Nabutola where both suspended when the re-appointed board at the time then immediately blew the whistle on the transaction, rumours of which had swept Kenyas tourism industry triggering a full scale investigation at the time. When reporting the news back then, and periodically in between as updates of the court case became available, a number of negative comments had to be endured over an alleged agenda by this correspondent, clearly fired off by sympathetic mouthpieces of the accused, and while justice has been served, and seen to be served in this case, it is personally satisfying to see that the projected outcome did happen, the accused were found guilty of all charges and their sycophants now have to bow their heads in shame for suggesting there was anything else to the reporting but sharing the sad facts of the case with a wider regional and global readership. The three convicted individuals do have the option to appeal, so watch this space for further news, as and when. 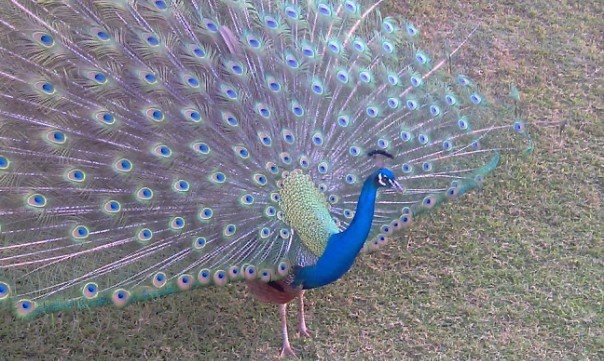 The silence of the African night was suddenly shattered by the eerie cries of some peacocks, waking me from my sleep in the deep of the night. It was cold, very cold, but still I went to the window, lifted the curtains to see outside and noticed shrouds of mist and fog drifting by, illuminated by the spotlight from the top of the Honeysuckle Cottage, the topmost cottage at the Aberdare Country Club. It was the weather I remembered from days long passed, the eerie calls of the peacocks too, having stayed here during the foggy season several times before and needing almost a compass on one or two occasions to find my way around the extensive grounds. I made the club my base for a few days while exploring the Aberdares and the nearer and wider area, including the clubs own 1.300 acres of a private game sanctuary extending up the Kamatongu hill. That private game reserve is home to Thompson and Grant gazelles, Impala, Zebras, Giraffe, Warthogs, Baboons and the elusive Leopard, to name but a few and plenty of birds of course too. I had returned to the club for the first time in perhaps 15 years, drawn by memories and the keen interest to see, how the change of ownership last year had impacted on the two properties, the club itself and the often more fancied Ark. But first let us go down history lane for a bit, to understand the how and where from and even the who, as some individuals are probably forever linked to the properties and deserve a mention and a place in the Aberdare Country Clubs history book. Going by all the information I kept since coming here first back in the 70s, met then and for long thereafter by the late Vena Johansson and of course the one and only Ian Hardy, and obtained since then from a variety of other sources, it seems the Steep, as the country side mansion was initially called by the original owners, was completed in 1937, after Robert, aka Mickey Spencer and Dot Lyons bought the land, located on the slopes of Kamatongu Hill, aka Ol Doinyo Larash and decided to build a residence there to make it their family home. 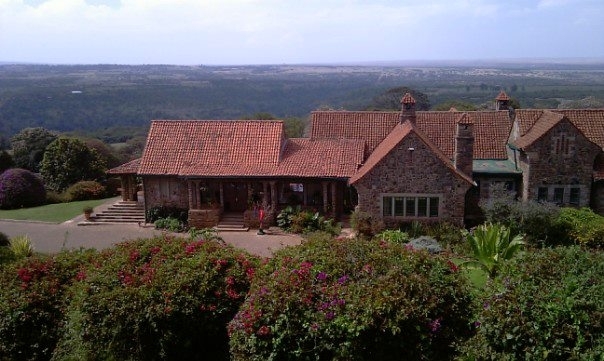 Designed most likely by Nairobi based architect Idris Davis, who is known to have designed the neighbouring Monte Carlo mansion in 1937 further around the hill, construction according to records found and through stories told, must have commenced in 1936 and the Steep remained in the family until 1970, when the founders kids Kevin and Storm eventually sold out. It was then renamed into the Aberdare Country Club and has ever since served as the base for the famous ship of the forest, aka The Ark, located inside the Aberdare National Park, though it eventually became a well known landmark safari inn in its own right. Now in its 75th year, new owners Marasa Africa have invested heavily to restore the shine of the club and all cottages and suites have undergone upgrading with new bathrooms and soft furnishings, while lovingly maintaining the ambience of the main building, its rustic appearance, the extended terraces, all the nooks and crannies, the lounges and fireplaces and the wood paneled dining room which easily can take visitors back by decades into days long passed, offering classic hospitality as it was then but reloaded into the 21st century of course. My own experience with the club and the Ark is going back to the days of Signet Hotels, Lonrho Hotels, Fairmont Kenya and now Marasa Africa, which bought the two properties after they appeared to being sidelined by Fairmont, showing remarkably little interest in them and instead concentrating their efforts on the Norfolk, the Mount Kenya Safari Club and their Mara Safari Club. From the almost shabbiness of those latter days has in particular the Ark made a remarkable recovery with all bedrooms now having their own private bathrooms, small but offering all which is needed for a nights stay, when watching the game from the lounges is the visitors main activity, not taking a bath. The Ark got a new lease of live for sure as the refurbishments are nearing completion now. Nearly 43 years old since it was opened in December 1969 it is again as good as new to continue receiving guests through Noahs Port and taking them aboard. There the wagenis are stationary, sitting perched above the waterhole, also expanded, and watch the game parade by, buffalo, elephant, bush buck, giant forest hog and if lucky a rare sighting of a rhino or a leopard. Illuminated at night, the stream of game coming and going is never ending. At the Aberdare Country Club, the golf course has been revived, the fairways cleared up and mowed, the roughs made less rough and in particular have the greens been restored. 9 holes of safari golf await the players, watched by warthog, impala, zebra and even giraffes, though it is the baboons which need watching as they are known to grab a ball which falls near them and run off with it. The loss of a ball though will not result in the loss of a point as such events are catered for by the clubs rules on natural hazards. Meanwhile was the pool modernized too, given an extended wooden pool deck with new sun beds and umbrellas, while just behind it a brand new, state of the art Spa and gym has been constructed, due to open within days after my visit. A few finishing touches were still missing and trained staff was on the way to bring the added component of treatments to live, now that Spas have become an almost essential part of a vacation. Next to arrive will be a couple of horses and the stables have been given a face lift and soon horseback outings will again be part of the clubs activities for visitors, able to ride across the sprawling grounds extending over 1.300 acres. 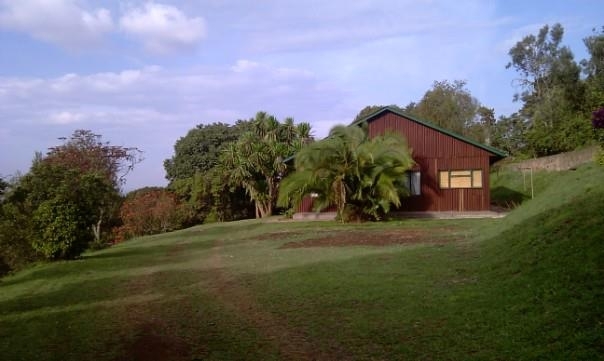 This makes the Aberdare Country Club a destination in its own right, and with the added attraction of going into the Aberdare National Park, be it for a stay at the Ark or just a days game drive, there is plenty to see and to do. In addition is the Solio Game Reserve nearby, where rhinos can be found with ease, making the club an ideal base for a break from the city for anyone needing a break from the daily grind. Sales and marketing activities are resuming now that the bulk of the work has been completed at the Aberdare Country Club and the new owners are happy to once again showcase it to Kenya and the world. The club offers 19 two bedroom cottages, both twin and double and of course all with their own fire place as mentioned earlier, and in addition there is 1 three bedroomed and 1 five bedroomed cottage, plus one very posh suite, making a total of 47 rooms. A modern conference facility complements the accommodation and corporate retreats, strategy sessions and general workshops and seminars are regularly being held here, the tranquility of the club and its grounds perfect to provide as conducive an environment as is needed to accomplish the mission. And for that purpose, team building exercises can be arranged with some little prior notice, not a problem given the range of outdoor activities once again available. A bush breakfast perhaps, or a picnic lunch at a scenic spot or even a bush dinner on that special occasion, not a problem at all as the logistics are all in place and the clubs F&B team is eager to please. For myself, returning to the Aberdare Country Club was like a homecoming, and already when seeing Kamatongu Hill from the distance my anticipation grew, increasing at the point of turning off from the main road leading from Nyeri to Nyahururu, then approaching the gate, now reconstructed to reflect on entry already the new things one can expect, and finally driving along the fairways up to the reception and have the main club building come into view. And then, after checking in, the first steps up to the terrace, one look across the manicured gardens, the peacocks in playful mood and all the good times come back, for me that is, and for others new memories are being created when the for the first time set foot into the club building. Kenya has many magic places, has many places with a history, and the Aberdare Country Club, build 75 years ago as the Steep is one of those places which make Kenya today what it is. Full of history, not just wildlife, full of character and full of tradition, hospitality tradition, which does not come much better than found here, at the Aberdare Country Club. Rise and shine, that call must have been heard loud and clear, because once again, the club does shine and the staff, many of them long serving faithful, are playing their part in making every visit a special one for me. Be it Rose, the Arks manageress who has risen through the ranks over the years or good old Nderitu in the dining room, both remembered alongside many others for their excellent services and their smiles. Getting to the club from Nairobi, via the Thika superhighway, takes about 3 hours by road, or a 30 to 40 minute flight from Wilson airport to the Nyeri airfield and then the short transfer by club vehicle upon prior arrangement. 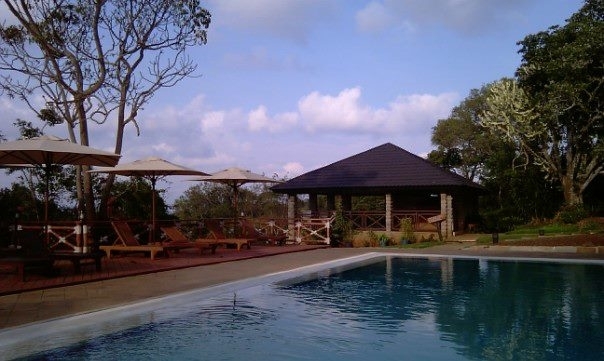 Visit www.aberdarecountryclub.com and www.thearkkenya.com for more details on bookings, rates and activities. The names Red Cross and hotels are not always considered compatible in the same sentence but in Kenya, the Red Cross Society is about to change that with a bang, when the new Boma Hotel will open its doors officially in a short while from now. On arrival, an attired doorman awaits guests, rushing to open car doors, helping one out of the vehicle and taking care of the baggage, briefcases or backpacks included, and a guest relations staff member will be at hand to assist with the check in where a scented cooled towel, I am told during the cold season that may well be a hot towel, is offered alongside some chilled Mango juice. A few steps from the reception is the coffee lounge and here the Wow effect comes into play, seeing the tall atrium and the blue glass canopy high above. Stylish comes to mind and certainly not something found in great supply yet in Nairobi, so this feature will set the Boma aside for a while to come for sure. A friend of mine described her feel on first inspection as masculine to which, true as that may be, I just had to add that if so it was certainly surrounded by very female curves. The hotel is currently undergoing trial runs, not even formally pronounced as soft opening stage as yet, and when open the new 5 star hotel in Nairobis Bellevue Estate / South C area will undoubtedly transform the wider area and act as a catalyst for what is very likely to be a spate of new buildings going up. Kenyas Ministry of Energy is already constructing their new headquarters nearby, kicking off a likely transformation of the formerly purely residential area in to a mixed zone of business, government, hospitality and residential buildings, a long stone throw away from the boundaries of the Nairobi National Park and within touching distance of the upcoming Southern Bypass which will in the future route transit traffic around Nairobi to decongest the city centre. A top class hotel, so near to such crucial infrastructure, is bound to benefit from it. The Boma Hotel, next door to the Kenyan headquarters of the Red Cross Society, and next to its sister property The Boma Inn Nairobi, previously known as The Red Court Hotel, will form the backbone of a new group of hotels, inns and very likely resorts in key towns and cities across Kenya. Wherever the Red Cross from here on sees opportunities to turn investments in the hospitality sector into medium and long term net contributors towards the societys annual budget for emergency responses, disaster relief and humanitarian assistance, Kenyans can expect to see either a Boma Hotel or a Boma Inn go up the former in the 5 star category and the latter in the 3 star category, according to Kenyan licensing standards. The investments are seen as a source of long term sustainable income, also expressing faith and confidence in the medium and long term economic prospects of Kenya, which remains the economic powerhouse in the East African Community. Profits from the Boma Hotels operations, according to the groups Managing Director Mugo Maringa, will be going entirely towards the Red Cross, once operating expenses and loan repayments have been met. The new Boma Hotel will feature 148 suites and rooms, including a top floor presidential suite with view over Wilson Airport and the Ngong Hills in the distance, and convinces through functionality, clear lines, pleasant colour schemes and the availability of all facilities a business traveler or in fact even tourist comes to expect today from a 5 star hotel. The pillows are soft, though harder ones are available on request, the mattresses firm and the duvets light and yet warm to keep the at times chilly night temperatures out of ones bones. The superior room category is large enough to impress while the de luxe rooms are spacious even in my own vocabulary, though the business and executive suites truly offer what makes the hotel special, that extra space with which a feeling of freedom comes. A working desk with a panel on the side for a laptop connection, linked to the flat screen TV, audio and video adapters, HDMI and USB ports as well as a printer and wired internet port makes in room working as simple as on ones own in the office. Easy chairs and an arm chair provide enough comfortable sitting, wardrobe space is sufficient and the bathrooms well appointed, all with shower and tub and some in fact with Jacuzzi baths. The hotel has a fully fledged Spa named Zoezi Kiswahili for Exercise, a gym and a dedicated aerobics studio, a pool for those daring to face the cool temperatures and on the culinary side two main restaurants, two bars, a coffee lounge under the massive trademark blue atrium roof and a 6th floor executive club lounge where for eligible guests snacks and non alcoholic drinks are available across the day, and where a daily happy hour takes care of the thirst for a beer, a glass of wine or some choice spirits. The food, though the kitchen brigade is of course still in its early days of blending together, was already excellent and eating my way through the menu over a combined stay of 5 nights, showed quality in preparation and presentation, as well as reasonable pricing, again something every visitor, for business or leisure, will appreciate. Service was on all occasions swift, as was the room service, which at first try took a mere 21 minutes only to be beaten to the door second time round with just 18 minutes from putting the phone down to having the trolley wheeled into my suite. As everywhere else, attention to detail and every staff members mind set on service with a smile does make all the difference, and will stand the Boma Hotel well when fully up and running. A business centre on the ground floor too is available to take care of printing needs, binding and all else a busy executive may require last moment to turn a presentation in one of the hotels meeting rooms into a 100 percent success. Here it is worth mentioning that within the Boma Hotel two executive meetings rooms are available while otherwise the main conference centre with multiple size options on rooms is located at the adjoining Boma Inn Nairobi, connected with a walkway and taking not more than a minute to reach. Notably, at the moment 6 sedan vehicles are available at a very reasonable cost for guests, with an airport transfer costing a mere 15 US Dollars or a trip to Wilson Airport just 1.100 Kenya Shillings, and a trip across town to say Westlands or beyond just requiring a little extra. It is such thoughtful and competitively priced services, provided without the rip off seen at some other places, which will gain the hotel friends and repeat business on the fast track, because such are key issues business travelers care about, but even more the locals who are expected to make the Boma Hotel their place in no time. Located half way between Jomo Kenyatta International Airport and Wilson Airport, the new Boma Hotel seems destined to pick up quite a bit of traffic from safari operators, which can spare their arriving clients the agony of having to stop and go and stop and go across the endless traffic jams of Nairobi on arrival, and departure for that matter, and when flying into the parks Wilson Airport is just 20 minutes away as the notorious Nyayo Stadium roundabouts, now jammed almost 24/7, are given a wide berth. According once again to the groups Managing Director Mugo Maringa, the Red Cross already is in the process to complete a Boma Inn in Eldoret, due for opening later this year, while the current Red Court Hotel in Nyeri will undergo a major transformation to add extra accommodation to the restaurant and meeting facilities already in place in this central Kenyan town. We are looking to eventually cover key county headquarter towns across Kenya with Boma Inns and for bigger cities like Kisumu or Mombasa the option for a Boma Hotel are being evaluated right now. If we are to go to a place like Malindi for instance, we would look at putting up a Boma Resort to complete the brand differentiation, yet with full recognition of Boma as the overall brand line. All profits from the hotel operations will be dedicated to the Red Cross humanitarian and emergency services programmes, so every guest staying with us will contribute towards the Kenya Red Cross Societys continued operations. Commendable indeed and whoever came up with the initial idea to have the Red Cross invest in Kenyas hotel industry, was surely foresighted enough to bring the two together for, as one so often hears, each others mutual benefit. The formal opening, for which President Mwai Kibaki, who is also the Patron of the Kenya Red Cross Society is expected to be guest of honour, will take place once all arrangements have been put into place and then it will be green light all the way, to help finance doing good by being very very good in what they do. Watch this space. Kenya Airways plans for the launch of their own low cost airline, Jambo Jet, will reportedly be subjected to public scrutiny, as the Kenya Civil Aviation Authority has invited the public and competitors in the airline industry to submit their comments, observations and objections at a hearing set for later this week. A decision by KCAA is then expected to be taken late this month, which is keenly expected by local and regional aviation observers. Intended to operate both domestic as well as regional routes, Jambo Jet would compete head on with privately owned local airlines such as Jetlink, which equally flies domestic as well as selected regional routes. While it is presently unclear, if the Embraer aircraft Jambo Jet is expected to use will be branded separately or else carry the Kenya Airways livery, the crews are definitely expected to be recruited from outside the present pool of pilots and flight attendants, in order to lower the cost base for the planned carrier. Said a regular contributor to aviation topics from Nairobi over the weekend: Low cost is really the wrong word to be used here, lowering cost is probably describing the whole issue better. In Europe the low cost airlines like Easy Jet and Ryan Air use selected airports for point to point flights, not the main hubs other airlines go to but maybe some distance away. Passengers take the bus or train to get there and the cost of operations in such places is much lower than at the main hubs. Those airports are keen for traffic and offer attractively priced service packages. Here in East Africa, there are no options for airlines. They all have to use JKIA, Kilimanjaro or Entebbe and the cost of handling for a so called low cost carrier is the same as for KQ or BA. So there are no savings to be found. The only savings are via lower labour cost but even that is a big problem now because to start with there are not enough qualified and experienced cockpit crew available. KQ has to hire expatriate pilots because they cannot get enough qualified Kenyans or East Africans. It is maybe only over the cabin crew recruitment they can find some savings, and by smart deployment which has crews home in the evening and not needing hotel accommodation outside their base. In any case, while for instance Jetlink will have to charge such fares as to meet their expenses, Kenya Airways has the option, because of larger capacity, to set aside some seats on each flight to be offered at special fares, like last year they offered stand by fares, no prebooking, you arrive, there is space, you buy your ticket and go. Those they could sell at even lower cost than other private airlines. It will be interesting to hear what objections are coming and then how KCAA will decide. There is some speculation that the airline may use Embraer 170 aircraft to launch Jambo Jet flights as and when the regulators have given their green light and possibly transfer the bulk of their domestic operations to the new outfit. This in the opinion of a regular source could leave the airline with only selected flights for instance to Mombasa operated by KQ outright and linked to their main hub and spoke operation periods while all other departures would be under the banner of the new outfit. Decision time it is this month, so be sure to watch this space for breaking news, as and when available. Reports presented to the Tanzanian parliament a few weeks ago, that up to 30 elephant a day are being killed by poachers due to rising demand in China and other Asian countries for ivory, made stark reading and put the continued survival of the last great herds of elephant in doubt. Tanzania presently estimates to have about 110.000 elephant in the main national parks, with the largest concentration in the Selous Game Reserve, thought to be in the 45.000 range. The Ruaha National Park, like the Selous also not receiving too many visitors compared with the Northern circuit parks of Serengeti, Ngorongoro, Manyara, Tarangire and Arusha, is said to hold as many as 35.000 elephant at present. Yet, in particular the Selous, a sprawling game reserve, often in the bad news of late over government plans for a hydro electric power plant and the hugely controversial plan to mine Uranium, is often cited as an area where poachers roam almost at will and where most of the elephant killings are taking place. The tourism trade, depending on an intact wildlife viewing experience, has as a result of the parliamentary report on poaching demanded that hunting permits for elephant be suspended, but from information received overnight it appears that officials reacted angrily over claims the animals might become endangered and stubbornly insisted that hunting must continue, so as to protect the revenue stream generated by the controversial activity. Following the recent sackings and suspensions on the top of the Wildlife Department, this was reported here as news broke, an acting wildlife official, a Mr. Paul Sarakikya, was named as the one who refused considering the request from the tourism fraternity, reportedly saying: At the moment Tanzania has more than 110.000 elephant, clearly implying that this figure will last for a while and permit continuous hunting of the species, in clear disregard of the fact that the parliamentary report puts the figure of elephant poached annually to nearly 10.000 alone. He was also quoted to have argued that if poaching would be controlled, it would leave enough elephant for hunting, again in total ignorance of the fact that Tanzania was for sure not winning the battle against poaching if not outright losing it. Tourism stakeholders accused the wildlife department of not having learned a lesson from the sackings over illegal wildlife exports last year, first exposed in the media, then denied and only eventually and grudgingly admitted to when parliament tabled whistleblower reports which eventually brought down the Minister for Natural Resources and Tourism and top officials in the ministry as a result. These officials only care about the fees they get from hunting. Do they even care about the animals? If the report in parliament is right, we are losing about 30 jumbos a day to poachers. Besides lipservice little is seen to happen. The president last year offered the support from the army to stop poaching, what has happened to this offer. Whenever we hear poachers have been arrested, it is a local event as if one part of those gangs hangs out rivals to dry and tips off authorities to get rid of competition. In 2011 the largest ever quantities of blood ivory were confiscated around the world. And international reports claim as much as half of that comes from Tanzania? This menace must be stopped in the markets in the Far East by those governments where their citizens are fueling poaching. Most of those arrested in Africa with ivory on them are Chinese. So what is China doing about that we wonder? And our own government has to step up and take decisive steps in fighting poachers. How many wardens and security personnel are in the Selous, how many in Ruaha? They know where poaching takes place and it seems they are not bothered. If government is not seen to play their part, they fail conservation, but then as you always point out, they fail on a big scale really was the reaction to questions posed yesterday from a regular source in Arusha, himself a leading member of the tourism fraternity. Meanwhile have other regular sources pointed at weak laws, besides weak enforcement which was cited as a major problem in the region. Not doing much is one thing but then, those who get nabbed, get out on bail almost immediately. Poaching for the tourism sector is a huge crime but by law the fines are little and jail time minimal. Most pay the fine laughing and get back to poaching there and then. The fines must reflect the level of economic sabotage poaching inflicts on us in East Africa, not just Tanzania. You in Uganda have the same problem, Kenya has the same problem. The laws need updating now, not next year or later. Our lawmakers are in part to blame for these delays and the cost it inflicts on us. Our reputation is at stake as conservation and tourism countries and this must be dealt with on both sides, enforcement and legal provision said another regular source from Tanzania, also declining to go on record for fear of repercussions. .
Time will tell how this pans out, but by the look of it, there is not much time left. Watch this space. Whatever hopes and expectations there may have been, as a result of President Jakaya Kikwetes visit earlier this week to Kenya, the Kenyan aviation and tourism sectors are far from satisfied. While speaking at a dinner organized for him by the Kenya Association of Manufacturers and the laying of a foundation stone at Brookside Dairys new dry milk complex, President Kikwete on visit to Kenya to improve relations dented by a range of misgivings on both sides of late over non tariff barriers and other mainly economic issues made a vague promise to improve the trading regime as well as look into the issue of the respective citizens working in the other country, another area when Tanzania is almost notorious for raising the hurdles almost at will, not a word was said, none known of anyway, over the significant restrictions placed on the aviation industry and the tourism sector. Tanzania, inspite of treaty obligations, is often handling flight clearance applications from Kenyan charter airlines as if they were foreign instead of being a partner state within the East African Community, with for instance Ugandan aviators claiming to need as much as 72 hours to obtain clearance, while Tanzanian sources have privately acknowledged that such applications from SADC partner state airlines are treated with much greater priority and given much faster responses. This has in the past angered the partners in Kenya and Uganda, which in turn, especially Uganda, have maintained an open door policy for EAC registered airlines to come into Entebbe at literally no notice, demanding either full reciprocity or else threatening to advocate for equal measures. As to tourism, several issues remain hugely controversial between in particular Kenya and Tanzania, namely the continued closure of the Bologonja border post between the Serengeti and the Masai Mara, where private traffic reportedly can pass following prior clearance but where tourist traffic is not allowed through. In addition, the need to have tourists change vehicles at the borders of Namanga or Taveta, is equally controversial and the leeway, to do the exchange in Arusha, seen merely as a window dress of a policy of non tariff barriers to keep competition away. Tourism sources from overseas, sending business to East Africa and having clients visit both countries, speak of the often perplexed questions of their clients why the itinerary flow is so fragmented and has to back track twice instead of just being able to get across the nearest border point, and have named this as a major cost factor for their safari packages. At the same time is the issue of a common tourist Visa controversial, with again reportedly Tanzania being the most opposed to the start of the measure, which though aimed to stimulate more cross border vacations and hence being ultimately financially beneficial for all participating member states in the EAC, has ended in a deadlock so far. Former Kenyan Tourism Minister Najib Balala minced no words early this year when he blasted his colleagues over the agonizing long wait to have something put in to place, on which at least at face value all have agreed but which some, behind the scenes, try to delay as long as possible. Kikwete did not comment on any of these crucial issues, having some observers in Kenya already term the visit a dismal failure, a judgment however thought too harsh as only time will tell if the catalogues of issues both sides brought to the round table meetings between the two Presidents and their delegations, will indeed be progressively worked on and then ticked off, moving on to the next agenda points. Watch this space. It was learned overnight that additional work worth some 15 million US Dollars will commence in October this year at Kamembe International Airport in Kigali. Growing passenger numbers, as a result of the network and fleet expansion by RwandAir and the operation of additional flights by a number of other airlines, resulted in full utilization of existing check in counters and other facilities, and with the new Bugesera International Airport still a few years away, extra investments were needed to upgrade and within the physical limits expand the present airport. The Rwanda Civil Aviation Authority has also reportedly dedicated some of the funds towards the introduction of the latest scanner technology for baggage and passengers which will replace older models. Here it is hoped that BOTH entrance check facilities will in the future be used, at all times across the day, to reduce the queues of passengers, often reaching into the outside parking area and not out of misguided rationalization as it has been put to this correspondent during past visits to the airport, only using one of the available scanners. Some funds perhaps would also be wisely spent to once again upgrade the attitude of those manning the check points as complaints about less than expected levels of professional conduct and in particular customer friendly behaviour seem to still persist to this day inspite of a spirited narrative of outright bad behaviour by some officials a while ago. In fairness, only one in three recent experiences was on the downside, showing that someone had picked up on the complaints but one in three negative hits is still an unacceptable situation when this is the last experience of Rwanda a traveler is taking home, often then souring an otherwise overwhelmingly positive impression from the many encounters with Rwandans across the country. Targeted in three phases the workscope is expected to include the congested departure lounge, the baggage claim and arrival areas. Traffic through the airport has in recent years grown by at least 15 percent annually, spurred by growing arrival numbers of tourists coming to see the countrys national parks and natural beauty and a constant stream of business and trade visitors from the region and beyond, wanting to exploit the stable political environment by opening up new markets. For more tourism information about Rwanda visit www.rwandatourism.com or check out www.rwandair.com. Welcome to the Land of a Thousand Hills. It was confirmed by a usually reliable source in Addis Ababa that Ethiopian Airlines, Africas first carrier to take delivery of the new B787 Dreamliner last month, will start to offer an initially three times per week service from Addis Ababa to Bangkok and Kuala Lumpur. The flights, due to commence on October 31st this year, will add two more destinations to the growing ET network around the world, as the airline, once the undisputed Pan African carrier, is making every possible effort to stay on top of Africas aviation sector. Neighbours Kenya Airways, with a similar expansion strategy and due to receive their first B787 in Quarter 1 of 2014, is equally vying for continental superiority as they too are adding aircraft and destinations to turn their 10 year strategic Plan Mawingo into reality. Ethiopian flies regular daily services from Addis to Nairobi and Mombasa, Entebbe, Kigali, Kilimanjaro and Dar es Salaam, connecting the region to their global network. Following an almost inexplicably long period as Acting CEO was Mr. Andre Viljoen finally confirmed as Chief Executive Officer of Air Mauritius earlier this week, having served in an acting capacity for nearly two years since December 2010. A regular source in Port Louis also confirmed that government at the same time also appointed a new Chairman of the Board too, namely Mr. Appalsamy Thomas, who had in the past served with the airline in various capacities including as Managing Director. The confirmation of Viljoen and the appointment of Appalsamy is generally seen as strengthening expertise on board level as well as affirming that the painful cost cutting measures instituted under Viljoen have been accepted by government as a way to reduce losses, though a restoration to profit is of course what will ultimately matter. Viljoen according to the details provided was previously working in senior roles at South African and COMAIR. Air Mauritius is according to information available operating a fleet of 12 aircraft, which include A340, A330, A319 and ATR 72. Congratulations to Andre and Happy Landings, wherever and whenever. Although the Seychelles Tourist Board dedicates promotional space under the headings Budget Holiday Accommodation and Seychelles Secrets on their state of the art website to this segment of the market, giving a detailed overview of licensed guest houses, B&Bs, self catering establishments and holiday apartments, the main thrust of overseas promotion regularly highlights the top end of the market, where world class resorts and Spas feature, projecting the destination with the glitz and glamour it evokes in peoples mind when they hear about Seychelles. Royal Honeymooners, Sports, Pop and Film Stars, Russian Oligarchs, Middle Eastern Sheikhs, Industry and Media moguls, politicians, top fashion designers for photo shoots, they all think of Seychelles as it is on top of their Most Wanted list of places around the world where they want to go and be seen, or not be seen as often is the case the islands are well known to protect the identity of their visitors. In fact, feedback from the island of La Digue would indicate that some rooms on self catering basis, albeit non air-conditioned though with a ceiling fan, could go for as low as 40 Euros per night during the low season. To get to La Digue of course two ferry crossings are needed, from Mahe to Praslin and from Praslin to La Digue, prices of commodities in the supermarkets or shops are higher overall due to the delivery cost of items from Mahe but, the total expense of a weeks vacation should not significantly alter. And for those less adventurous, not wanting to cross the ocean in what will turn out to be a great experience on sunny days, even on Mahe itself rack rates for some establishments listed on the STB website are as low as 36 Euro a night, or about 50 US Dollars depending on the rate. Truly, no one can call that expensive or unaffordable, given the location and the fact alone of being in the Seychelles. Yes, those establishments are simple, perhaps even basic, but then, when spending the day out on the beaches or criss crossing the island by bus, it really only takes a decent bed and a shower for the few hours at night spent in the room and general standards of hygiene and compliance with local regulations is guaranteed by regular inspections by tourist board licensing staff. Within the space of two weeks, after STA and the National Human Resources Development Council handed over air tickets to 14 students selected to go for their Bachelor Degree Course in Irelands Shannon College, did news emerge that the Irish institution has offered the Seychelles Tourism Academy a further 15 places, allowing another batch of students to be selected and sent for the same course. Human resource development and skills transfer is a hugely important component in the Seychelles way forward for the countrys tourism industry and with a growing number of Seychellois graduates now becoming available, and more being trained both at STA and at Shannon, this process is gathering momentum now. In the same announcement it was also confirmed that another lecturer of STA will be given the opportunity to undergo intensive training in teaching techniques and methodology at the Shannon College for a period of two weeks, giving the coordinator at STA for the degree programme cooperation, Stella Bergman, the opportunity to travel to Shannon under this offer. Both the Minister for Tourism and Culture, Alain St. Ange as well as the Principal of STA Flavien Joubert, hailed this latest offer from Shannon as a sign of ever closer and stronger cooperation between the two institutions, from which in particular the Seychelles have benefitted. STA is the choice partner in the Seychelles for Shannon, which has only recently turned down overtures by UniSey, rather relying on a proven performer in hospitality and tourism training, namely the STA, where all facilities exist and where the project to build a state of the art academy is bound to create even better training and learning opportunities for students, than having to engage with additional partners lacking the sector specific experience, the facilities and arguably the resources to duplicate what does already exist at STA or is being created at considerable expense. Well done to Shannon for their apparently boundless support for STA and best of luck to those selected to go abroad for training. Watch this space. Following a recent article in which the concerns of the Seychelles private sector were expressed, and questions asked about a number of pressing and increasingly controversial issues vis a vis Air Seychelles and in particular Etihad, did the alarm bells shriek in some quarters of the Seychelles establishment. Yet, as became apparent yesterday in a meeting between the SHTA and the Minister for Tourism, these issues are indeed as important to the private sector as individuals, leading members of the tourism trade by the way, had expressed to this correspondent while on the islands last week. They asked questions, not all of which were in fact reflected in the said article, as it was clear they would strike a nerve within certain quarters and prompt a sharpish reaction. Those questions were raised in the spirit of constructive engagement, and those who regularly read articles about the Seychelles here, know that there is overwhelming sympathy and support for the archipelagos tourism industry right across the board. A media release just received, about the meeting and what was said by the Chairman of the Seychelles Hospitality and Tourism Association Mr. Louis DOffay, once again spell out the issues raised in the article of last Wednesday and this correspondent affirms each and every aspect to be correct and valid, no matter how much it hits the raw nerves of those now under scrutiny and increasing pressure, to accept the private sectors recommendations and demands. Read what Mr. DOffay had to say and in what spirit this was said, not to seek confrontation but to constructively engage government and avoid that the goose which lays the golden eggs is slaughtered on the slab of expediency and misguided protection of a course going into the wrong direction. The Seychelles has been taking note of addresses, remarks and questions coming from a series of public meetings for the islands tourism industry across the main islands of Mahe, Praslin and La Digue. It was the Louis DOffay, the Chairman of the Seychelles Hospitality & Tourism Association (SHTA) himself who addressed the private sector players at the Praslin and La Digue meetings, and he was accompanied by Daniella Payet-Alis, the associations Vice Chairperson. Louis DOffay took the floor after Alain St.Ange, the Seychelles Minister responsible for Tourism and Culture had delivered his own address. The series of public meetings had been called by the Minister as a means to hear the trade and to openly offer an opportunity for a public dialogue between the Tourism Minister and the islands tourism private sector. Mr Louis DOffay, the Chairman of the Seychelles Hospitality & Tourism Association (SHTA) started his address saying: Today we are happy to be standing with the Minister of Tourism on Praslin for their third meeting with the Tourism trade. The initiative to hold these public meetings speaks volumes on the determination of the Ministry, and of its Minister to remain connected with the industrys front line team, us the trade. As chairman of the SHTA I thank the Minister for his personal effort in leading his Ministry with us in his mind. Listening to us, hearing us and understanding us is easier said than done, but with the Tourism Minister I can say this is so. Is all well? No, and I would be lying if I said all was well.. This is why I am personally happy Minister that you have undertaken this series of public meetings with the Tourism trade. The importance for us, the tourism trade, to be working with the Ministry of Tourism and the Tourism Board is Priority Nº1 on our list. Today publicly I say thank you to Minister Alain St.Ange for his offer to meet with me as Chairman of the SHTA on a monthly. This offer is commendable. It shows the importance given to our private sector association. This is a new practice for a member of the Seychelles Government, but Minister Alain St.Ange was one of us, and he comes from our ranks. As Alain St.Ange, he worked alongside us most of his life. Because we all know him also points to us the void that was created when he moved from being the one in charge of our countrys Marketing. With our support he changed the way the marketing of Seychelles was done, and he succeeded, that is clear, but now that he has assumed the position of Minister, we have seen the hole he left behind. This void has prompted us, the tourism industry, to seek the acceptance of a new private sector led Marketing Committee to be advisory body for the Tourism Board. This has been accepted, and we are thankful, as this will help us through this difficult time. Tourism is going through the most difficult period with our main traditional markets suffering from their own economic difficulties. This is why we asked for continued togetherness in how we move forward from now on. We know that we need visibility as a small country. 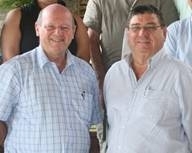 This was a means never handled before Alain St.Ange took over the responsibility of marketing of Seychelles. But visibility then became a necessity. Those of us who travel to trade fairs, and who conduct sales calls will appreciate how more talked about we are today, and how the tourism trade in all our key markets are today more updated on the Unique Selling Points of our Seychelles. I am unsure if it is the Minister himself or the News Bureau of the Tourism Board who undertook this mammoth task, but their effort is paying off and their effort is working. This is where we now need to get more positive news to the Ministry and ensure that positives from our end also makes the news, and in so doing keeping the word Seychelles in the forefront. We all have to be realistic, positive news is not news. Expecting press to report on our beaches and on our natural beauty is not going to happen anymore because this same press has written over and over again of these key assets of ours. We have to be innovative and we have to be intelligent now to move forward to continue to have the word Seychelles on the world news wire. Here on behalf of the SHTA, we appeal to everyone sitting here, and to everyone in Seychelles to work with the Ministry of Tourism to keep Seychelles in the limelight and visible on the newswire and on the press at large. Marketing of Seychelles is also today an area where we all need to pull together. I was one who screamed about direct flights to Paris and Europe. This I still sincerely believe that it is a needed service for our islands tourism industry. Our country is disconnected unfortunately with what we have as policy guiding the Minister of Transport, and what we have guiding the Minister of Tourism. But as Ministers look at Seychelles and not just at Air Seychelles we have us, the trade to look beyond where we previously looked for tourists. This same point was made at the Mahe meetings, and today I am reiterating the point because it is important. Never forget that in the three points given by Blue Panorama for discontinuing their Seychelles flights one is the handling charges at the Seychelles Airport which is four times more that our competitors. It is Transport who can bring our charges into line, or it is also them who can open up and allow competition. This is why we today need to rally to work with the Tourism Board to diversify our tourist markets. China and India, yes we need to follow as an industry, but let us look at South Africa now that Air Seychelles has confirmed that they will have four flights to Joburg from December. We all know that Air Seychelles cannot grow that market to double their passenger numbers to make four flights viable. This is where the twin centre approach with Brazil, South and North America is so important. South Africa has developed that Brazil market, and today it is working for them. Seychelles needs to be intelligent and piggyback on South Africa. We are happy to see that all our DMCs are now moving to Brazil to continue the works the Tourism Minister has personally started. This does not mean we must not continue to fight to get, a not only direct, but a nonstop flight to Paris. It is a needed boost we need for our industry. We must also put a greater effort on the Russian Market. But these negatives have still not stopped us on our road to advance our industry forward. The much awaited Tourism Masterplan, we all took part in its planning and participating in its deliberations is now with us, we are looking at a revised VAT from January that will reduce our operational costs, we are moving Louis DOffay said. The Seychelles Minister, Mr Alain St.Ange welcomed the support received by the tourism industrys private sector. As he thanked Mr Louis DOffay at the Praslin and La Digue meetings he said that his Ministry remains willing to continue to work with the industrys association for the continued consolidation of the Seychelles Tourism Industry. At the La Digue Island public meeting Minister St.Ange was also joined by Ambassador Barry Faure, the Secretary of State in the Presidents Office and Chairman of the Tourism Board and the La Digue Development Board. With all this said, and correctly reflected in a communiqué from the Ministry of Tourism and Culture in Victoria, I rest my case. In what has been termed a miraculous escape amongst the maritime fraternity on the Seychelles was the three man crew of the ferry boat Le Cerf rescued after their vessel sank in a storm while returning to base in Mahe. Owned by Masons Travel, one of the Seychelles leading DMCs, the vessel was enroute back from Denis Islands when it was struck by freak waves, damaging the hull and taking on water. The experienced skipper sent an immediate SOS out which was picked up by the Seychelles coast guard which dispatched a rescue mission immediately but the actual rescue was then accomplished, after the crew was adrift for over 4 hours since abandoning their sinking vessel, by a Praslin based yacht. A source in Victoria, when spoken to overnight, attributed the rescue and safe return of the crew also to the regular safety training of crews engaged in tourist transfers by boats and by carrying all required safety equipment like rafts, life vests and other equipment, helping to survive a potential ship wreck. The news spread fast when the vessel went into distress and as light faded, a number of leisure boats went out to sea to assist in the search, helped by the crews use of mobile phones. The skipper and his two deck hands used their phones to give status and position updates to the search teams which in turn used powerful search lights which were eventually spotted and used for the final rendezvous between rescuers and the crew afloat. Seychelles has in past years strengthened the capacity for search and rescue in our territorial waters, in part triggered by the piracy problem which our country tackled with full determination. In the process a lot of training was done, and this has benefited our maritime safety considerably. Earlier this year we guided a stricken cruise ship to port in Victoria when our coast guard ran a successful mission to bring that ship safely to port. As an island nation we depend on shipping and ferries to travel between the islands and our safety record must be maintained to protect our tourist industry. Hundreds of people travel every day between Mahe and Praslin and between Praslin and La Digue but also a lot of other islands and safety is the highest priority. Boats and ferries are inspected regularly and emergency drills and training are ongoing all the time commented a regular source from Victoria when discussing the emerging news. Congrats to the rescue teams for a job well done. AND in closing today once again some interesting reads taken from the Livingstone Weekly courtesy of Gill Staden, THANK YOU! This week all three proposed mines/mining activities in our region of Southern Africa are making news. In Zambia we have the proposed Kangaluwi Mine in Lower Zambezi National Park; just over the river in Mana Pools National Park and World Heritage Site is the proposed mining in two rivers for Heavy Mineral Sand Deposits and finally a mine, Fairbreeze, in South Africa which is set to destroy Mtunzini Conservancy. The problem with mines is that they destroy the environment. I have never heard of a mine which was environmentally friendly. The mining companies blast the land to excavate the minerals underneath. They require huge amounts of water; they use toxic chemicals which leach into the environment, especially rivers from which we draw our water. In Africa with generally high unemployment and poverty, the mining companies always propound the virtues of the money which the government will gain from mining activities and the jobs they will create for the poor people. Often governments are swayed by these arguments as they do not think of the next generation, merely their time in office. Conservationists on the African continent often have a bad name because they are always portrayed by governments as wanting to slow development probably because, as governments often think, conservationists are just jealous. This, of course, is untrue: conservationists think about their childrens future. They want their children to see the beautiful wildlife areas as we see them today. They know that in a world where greed is seen as the norm, maybe money isnt everything. They also know that mans impact on the environment is destroying the planet we are losing our forests, our waterways, our wildlife. If the devastation of our natural resources continues, in the years to come, man will wonder how it all happened but, by then, it will be too late. So how do conservationists in Africa try to get their message across to the law-makers in governments? In South Africa the conservationists have got a lawyer on board who has written a detailed account of the erred Environmental Impact Assessment for the Fairbreeze Mine and the impacts on the environment were the mine to go ahead. The conservancies and wildlife NGOs have also written down their concerns all of these have been submitted to government. In Zimbabwe the Zambezi Society is keeping the proposed mining in Mana Pools in the public eye by constantly putting the information out there and submitting documents to government. In Zambia we have done little about the proposed mine in Lower Zambezi and, in fact, all has been very quiet on that front. So, I was pleased to see an article by Peter Steyn who has recently visited the area and have included it below. Zambia has a different population to that of South Africa and Zimbabwe. Having just found wealth from our mines we have a new rich elite who mostly live in Lusaka working for government, NGOs and Embassies. These people are so happy with their income spending it all in the fancy shops in shopping malls made up of South African trading companies; they rarely visit Zambias wilderness and have little knowledge or care about it – more concerned over their latest pair of shoes. Stakeholders were invited to a 2-day meeting in Lusaka to discuss the future of hunting in Zambia. Zambia has 35 Game Management Areas (GMAs) as well as its 19 (20) National Parks. (Number 20 is the Lusaka Park which is yet to be completed ). The Game Management Areas border on the National Parks and are meant to form a buffer zone between the villages and the parks. These Game Management Areas have been used for hunting. Leases for GMAs have been given to companies who are then given licences through the Zambia Wildlife Authority (ZAWA) to hunt a certain number of animals. Over the years, though, interest by ZAWA has been more about the income raised from issuing hunting licences than about the number of animals remaining in the GMAs. Many of the GMAs are now valueless as hunting blocks; their animals have mostly been shot those that have value to the hunter, at any rate. Hunters want to shoot lion, leopard, buffalo, elephant. In a bizarre comment one wildlife administrator stated that it was difficult to know how many lions were in a certain area because the lions hunted at night. Having visited so many parks and chatted to Game Scouts, I know that the scouts know exactly how many lions are in their areas. If the administrators for ZAWA actually took time to go into the Parks and GMAs, and talk to their scouts and tour operators they would find out how many animals there are. Game Management Areas are actually owned by the communities but administered by ZAWA. It is ZAWA who collects the fees from licences and is supposed to pass on a percentage to the communities. But, at the meeting, it came to light that ZAWA owes K1.6 billion (US$320,000) to the communities. Sylvia Masebo, the Minister of Tourism, stated that this money would be paid by the end of the year and that all future income from licences will be put into a separate account. It would appear that 20 GMAs will be up for tender by companies. (This means that 15 GMAs are depleted?) In the past leases for GMAs have often been given to companies who merely sub-lease to hunters. There have also been instances where caring hunters have refused to buy licences from ZAWA to shoot certain animals because they have said that the numbers are too small to hunt this has angered ZAWA who need the money. So, let us see the government issue leases to hunting companies who are going to hunt themselves and not sublease and also to companies who can say, without recrimination, that they will not hunt certain animals because of the lack of numbers. We actually do have a number of ethical hunters in Zambia it is them who need to be given these leases will it happen??? As the editor of Safari (Africa Geographics digital travel magazine) – Paul Steyn spends his days submerged in the world of digital story telling. When coming up for air, he prefers it to be in the middle of some type of breathtaking wilderness. He is obsessed with finding new and interesting ways of distributing digital content to anyone on the planet with even the remotest passion for Africa. Make sure you check out Safari interactive magazine for yourself. Kangaluwi: The Lower Zambezi National Park battle begins! Alright, just a quick note before we start. I would hate for you to get half way through this post, throw up your hands in disgust and say: Not another seedy mining project. People are horrible, Ive had enough, whats the point?. I mention this because these were some of the thoughts that came into my head when I first heard about the plans to mine copper in the Lower Zambezi National Park. Maybe Im more susceptible to the emotional effects of this news, having recently visited the area this year. Experiencing the quiet flow of the Zambezi River and the animals that live off it; the big trees that decorate its bank and the feeling of being in wilderness that stretches inland for another 5000 square kilometres it just does something to you. When you become touched by a place like this, it makes it all the more difficult to come to terms with plans to destroy some of it. But rather than get jaded or emotional, I always say its better to get educated and proactive. So here are a few of the facts about the Lower Zambezi National Park and proposed Kangaluwi copper mine. The Lower Zambezi National Park is being considered as part of a greater World Heritage Area which includes the famous Mana Pools National Park. Despite a decision by the Zambian government to halt any mining in and around the Lower Zambezi National Park, a grant was given to Australian company Zambezi Resourses (A subsidiary of a much bigger company called Proactive Investors) to carry out a large scale open-pit mining license for a period of 25 years at Kangaluwi (In the middle of the park). Zambezi Resources has set up a sub-subsidiary company in Zambia called Mwembeshi Resourses. It appears that there is more than one area under prospect by Zambezi Resourses. According to their report, there are several sites nearby which have potential for copper and gold. Its been a number of months, and, although submitted, there has been no word as to the result of the Environmental Impact Statement (EIS). The news will come from the Zambia Environmental Management Agency (ZEMA) which has remained very quite through public opposition. Open pit mines are a messy business, and include huge destruction of the area and surrounds. The issues of pollution, infrastructure, roads, noise and poaching traditionally follow these mining projects. The proposed mining area is 50 square kilometres and will be seen from the Zambezi River itself. Now for a few personal thoughts. Of all the players in this scenario, the people I would most like to hear from are Zambezi Resourses or rather the Australian parent company Proactive Investors. Id like to understand how an Australian company can make a claim on African resources at the expense of an iconic African National Park even if the Zambian government, for some reason, does grant them permission to do so. There is surely an injustice here? On the Zambezi Resourses website I found an investor news feed about progress on the Kangaluwi mine, but in seven posts it failed to mention once that the planned site is right in the middle of a National Park. I wonder if the investors know this is the case? And if they did, would they think twice about the financial and if they have a conscience environmental risks? The only paragraph on the website mentioning the environment reveals that they have outsourced the Environmental Impact Assessment to a company called GeoQuest. Apart from sounding a bit like a computer game, the Zambian companys core focus is consulting and contracting for the mining sector. Due to high demand, as they state on their website, they have now developed a department that can handle environmental impact assessments. The cynical side of me starts to itch here. I can just see their board meetings now: This is brilliant, they say, We can be the consultants, the contractors AND the environmental assessors all at once. We consult and refer ourselves as the environmental assessors, and then when we give the go ahead to mine, we can take on the big contract too. Isnt that a conflict of interest? Someone might say. No. The interest is to mine and make money and that is all that matters. I only bring up this point up to illustrate how absurd the whole situation is. You dont need a professional assessment to tell you that it is right or wrong to dig up a nationally proclaimed conservation and biodiversity area a patch of land that has been specifically set aside for the posterity of future generations and the financial benefit of the country though tourism. I would love for somebody to sit me down and tell me why it is not wrong to mine in a National Park. Give me some long-term benefit for Zambia that trumps the environmental, economic, spiritual and cultural losses incurred over the next 25 years of open pit mining on the Zambezi escarpment. You might bring up the economic debate. And yes, I would say in an ideal world some of the economic benefits of mining should go to the people and the communities, but Im afraid they never do. This has been proved over and over again. The money goes off shore and into government coffers. And 25 years later we will see the damage, look back and wonder how this could have happened. This is why I think Zambezi Resources fails to mention Lower Zambezi National Park in their investor news reports. Its because they know that at the core of it Kangaluwi Mine is wrong. They wont admit it for whatever reason, but they know its wrong. You may accuse me of over-simplifying this, but to me it is simple. The area is in line to become a World Heritage Site, is defined as a category II protected area and despite vows by the government and local chiefdoms not to exploit this area for mining purposes, plans still go ahead to destroy and poison a watershed in one of the last remaining pieces of wilderness in the world. No mining conglomerate should be able to justify this kind of exploitation. And if they dont feel they need to try and justify it to us, the Australian public and the world, then they at least need to justify it to their investors who would be contributing to the wholesale destruction of this Park and the Zambezi Valley. I cant say for sure why (although I have my suspicions), but nobody in power is taking responsibility for this mine in Zambia. So its up to us to point out how obviously wrong it is. Because sometimes the obvious needs to be pointed out by a lot of people at once in order for others to take notice. Much of Botswana’s wildlife could be wiped out by 2017, according to a new study on the impact of poaching in the Okavango delta. The consequences of at least 100 000 animals a year being killed over the next five years will cause a massive decline in tourism and the economy as wildlife is one of the main reasons why foreigners come to the delta. The domino effect on Maun in general and for safari companies and lodges will be significant. 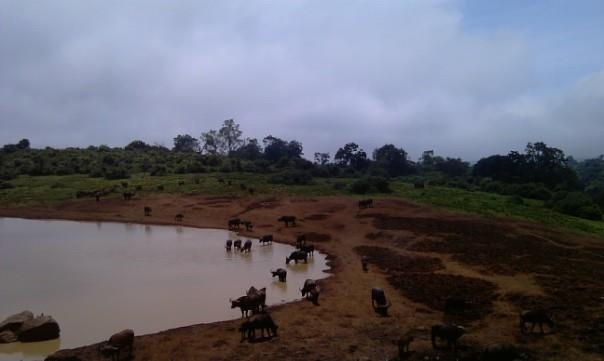 There is also the danger of foot and mouth disease (FMD) spreading more widely as the illegal trade in bush meat gains a foothold in cattle farming areas. Poaching is also likely to increase significantly as soon as the trophy hunting ban in northern Botswana comes into effect from October 1. According to a recent presentation made to the parliamentary commission on tourism, the director of the Botswana Predator Conservation Fund, Tico McNutt, quoting from studies previously undertaken, says there has been a significant decline in most recorded wildlife species. These include impala, zebra, tsessebe, kudu, giraffe and lechwe. Since a 1996 survey by the Department of Wildlife and National Parks (DWNP), only elephants and Cape Buffalo have shown an increase in numbers. There are at least 180 000 elephants in northern Botswana. McNutt says the only conclusion to be drawn from this is that illegal hunting poaching will be responsible for the decline. The report says: While the actual frequency of illegal hunting remains unknown in NG26 concessioin area, results demonstrate the potential impact of uncontrolled hunting. Importantly, illegal hunting could entirely account for the significant declines of wildlife populations in the Okavango, as reported by Michael Chase in 2011. There is a nearly continuous removal of wildlife for meat despite an Anti-Poaching Unit (APU) presence in the area. The report adds that a professional hunter who hunted in the area for 14 years until 2009 catalogued photographs as evidence and estimated conservatively two giraffe per week were being killed in the eastern sections alone. Wildlife management areas (WMAs) drive the bush meat trade and when coupled with the fact that there are few consequences for illegal activity, such as few arrests, low fines and a few prosecutions, it can be assumed, the report says, that poaching will continue until the laws are changed. In addition to illegal hunting is the poisoning of carcasses which results in vultures, for instance, being found dead as well as other scavengers. This week, an attempted poaching of a buffalo in the Chobe National Park was averted by a safari guide who with his clients had watched a vehicle come to a stop near a herd and shots fired, wounding a buffalo. A scuffle broke out between the guide a professional hunter and the alleged poacher, who was later traced by police but denied having been in any incident. Police however went to the scene and found a badly wounded buffalo which they then shot. The alleged poacher was later arrested. Thanks for sharing your thoughts on business class flights to dubai from london.